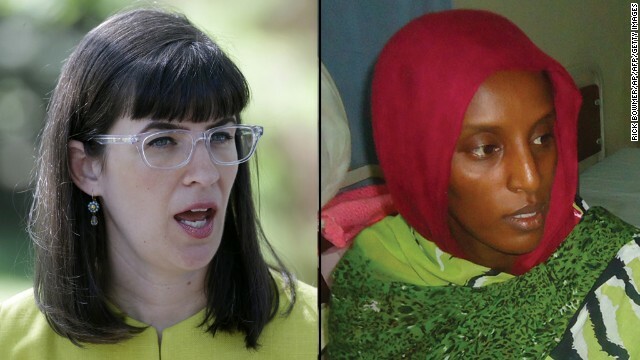 (CNN) - A Sudanese woman has been freed from prison a month after being sentenced to die by hanging for refusing to renounce her Christian faith. "I am a Christian," Meriam Yehya Ibrahim told the judge at her sentencing hearing in May, "and I will remain a Christian." An appeals court in Sudan ruled that a lower court's judgment against the 27-year-old was faulty, her lawyer, Mohaned Mustafa El-Nour, said Monday. He declined to elaborate. An international controversy erupted over Ibraham's conviction in May by a Sudanese court on charges of apostasy, or the renunciation of faith, and adultery. Ibrahim was eight months pregnant when was sentenced to suffer 100 lashes and then be hanged. "I'm so frustrated. I don't know what to do," her husband, Daniel Wani told CNN in May. "I'm just praying." Wani, uses a wheelchair and "totally depends on her for all details of his life," Ibrahim's lawyer said. Ibrahim was reunited with her husband after getting out of custody, her lawyer said Monday.